"We're making it possible for deaf and hard of hearing people to have equal access to information via the Internet." That's according to Samuel Slike, an instructor and curriculum coordinator of the Education of the Deaf/Hard of Hearing Program at Pennsylvania's Bloomsburg University. 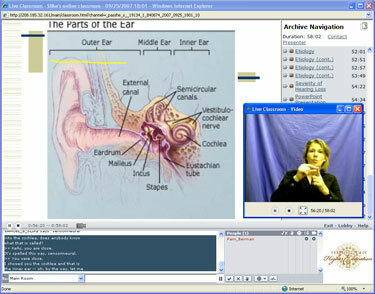 Last semester, Bloomsburg began using Wimba's Live Classroom, a Web-based learning tool, to offer deaf and hard of hearing students an online course that includes a sign-language interpreter and closed-caption text to accompany the standard slide presentation and instructor's voice. The remote class, which Slike teaches, is an introductory course on the history, education, and guidance of the deaf and hard of hearing. It's a prerequisite to a master of science program for teachers of the deaf and hard of hearing; Bloomsburg is well known for providing educational opportunities for the deaf. Because the Bloomsburg masters program is one of only three in Pennsylvania and 70 in the country, Slike explained, it's an important step to be able to offer it as a distance learning option. Last spring, a student in Hawaii successfully participated in the remote class. During the two-hour weekly class, all students can remotely view Slike's slide presentation on the Wimba display. Hearing students can listen to the lecture; deaf or hard of hearing students can either watch the sign language interpreter on the video screen, who works in front of a Web camera, or they can read the closed-caption text that scrolls across the screen at the same time. The captions are also useful as a backup for hard of hearing students who are just learning to use sign language, Slike said. Along with Wimba, Slike uses a product called Caption Colorado to provide real-time caption text. "There's a lot of rich information happening at once," he said, "whether you're a deaf or hearing student." Slike has been training teachers of the deaf and hard of hearing for nearly 30 years, and says he's always been interested in what technology offers, he said. "To me, the Internet was a given" for reaching different student populations, he explained, but he specifically wanted to find a vehicle for offering real-time lectures. "I knew I wasn't crazy about just sending emails and documents. I wanted it to be real… as if students were in front of me when they're really not." The Wimba project began with a $53,000 state grant two years ago to explore online classes for special needs populations across Pennsylvania. Although the grant focused on a different Web-based lecture presentation tool, Slike said he switched to Wimba eventually, since that's the product the university uses for other courses. A technology specialist at Bloomsburg, Pam Berman, worked with Slike to help design the Wimba sessions. Slike said he expects word to get out as the program continues. About half of the entire masters program could be offered online to remote students, he said. For the remainder, students would have to be physically present, since it requires face to face interaction or student teaching. Other colleges or universities interested in using real-time interpreted video may want to contact Slike and compare notes; he said he's scoured the country and hasn't found another instance of a higher education use of real-time interpreted video and real-time close captioning simultaneously with a spoken lecture. "As far as we know, this is really cutting edge," Silke said.